Although we first saw n2a Motors' Anteros back at SEMA two years ago along with the 789 retro-rod. 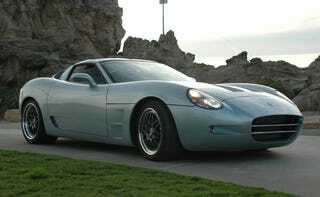 Well, the custom coachbuilder's got a brand new bag of C6-modified tricks up its sleeve. The custom carmaker's bringing the latest version of the Anteros to the LA Auto Show later this month. This new Anteros hotness is built on the 2009 Chevy Corvette, and as usual, it's got a carbon-composite body that again looks more at home in Cambiano, Italy than Bowling Green, Kentucky. The new design looks to feature a ZR1-style side scoop design, but unfortunately, due to a lack of rear shots, we've no idea whether the rear gets the same googly-eyed taillights as the last model. n2a's bringing both a coupe and a convertible version of the Anteros, with the black convertible built using a stock 2009 Corvette donor car. The drop-top features the 430 HP, 424 lb-ft of torque LS3 V8 under the hood. The silver coupe, pictured above and below, goes a bit farther up the performance stream, thanks to the donor body — a 2009 Corvette Z06, modified with Lingenfelter’s 630 HP performance package. All base models include a carbon composite body, hand-stitched leather interior, three-piece aluminum wheels, and a custom cat-back exhaust system. The best part? Chevrolet’s 100,000 mile powertrain warranty remains completely intact and the Anteros can be serviced at any GM dealership. Pricing for the turnkey Anteros coupe starts at $149,500 and the Anteros convertible starts at $154,500. Want to go for the high-powered version? Anteros coupes built on the Z06 platform start at $176,500. Performance packages ranging from 525-1000+ horsepower are available for an additional cost. Full press release below. SANTA ANA, California, November 10, 2008 – n2a Motors, Inc. announced today that it will debut its latest model, the Anteros, at the Los Angeles Auto Show on November 21st. Continuing a tradition of unique styling and impressive performance, the Anteros is built on the new 2009 Corvette platform and features a body reminiscent of iconic Italian designs. Built from modern lightweight carbon fiber, the Anteros is available with a variety of performance and appearance options. n2a Motors is taking orders for January 2009 deliveries. n2a Motors will be displaying the first production convertible and coupe versions of the Anteros in their exhibit. The black convertible is built using a stock 2009 Corvette donor car, featuring the 430 hp/424 lb.-ft. torque LS3 V8 engine that gets 16 MPG city and 26 MPG highway. The silver coupe is based on a 2009 Corvette Z06 and is modified with Lingenfelter’s 630 horsepower performance package. All base models include a carbon composite body, hand-stitched leather interior, three-piece aluminum wheels, and a custom cat back exhaust. Chevrolet’s 100,000 mile powertrain warranty remains completely intact and the Anteros can be serviced at any GM dealership. Each Anteros takes approximately 12 weeks to build from the time of order. n2a Motors starts by removing the donor Corvette’s body panels and installing the new carbon-composite Anteros body, a process that takes nearly 800 hours for n2a’s coachbuilding craftsmen to complete. The interior is entirely new with re-contoured leather seats, leather dash, Italian carpeting, and leather-wrapped interior panels, while the wheels and exhaust are removed and replaced with n2a’s custom-made components. The turnkey Anteros Coupe starts at $149,500 and the Anteros Convertible starts at $154,500. Anteros Coupes built on the Z06 platform start at $176,500. Performance packages ranging from 525-1000+ horsepower are available for an additional cost. The Anteros is the follow-up to n2a Motors’ 789 model that debuted to critical acclaim at the New York International Auto Show in March 2008. Inspired by the designs of the 1957, 58, and 59 Chevrolets, the 789 was hailed as “merely the coolest car…on the planet” by the New York Times. The 789 is also built on the C6 Corvette platform and utilizes a carbon composite body. Coupe 789 models start at $139,500 and the convertible base model is $144,500. A convertible 789 will also be on display at the LA Auto Show. The LA Auto Show is held at the Los Angeles Convention Center from November 21-30, 2008. n2a Motors can be found at the LA Auto Show in booth number K-620 in the Kentia Hall.